Weston 19-0113-W 38mm Collagen Sausage Casing - Makes 15 lb. 38mm Collagen Casing - Makes 15 lb. 19mm Collagen Casing - Makes 15 lb. 19mm Smoked Collagen Casing - Makes 15 lb. 19mm Collagen Casing - Makes 30 lb. 21mm Smoked Collagen Casing - Makes 15 lb. 33mm Collagen Casing - Makes 15 lb. 33mm Collagen Casing - Makes 70 lb. What is the difference between edible processed and edible natural casings? Edible processed casings are pre-shaped so they're uniform in size, and they're ready to use with no prep work required. Edible hog casings are all natural, so they'll need to be rinsed, soaked, shaped, and prepped to be used. Use Weston 19-0113-W 38mm collagen casing when making a processed, smoked, pre-cooked, semi-dried, or dried sausage. Made of edible beef collagen, this processed casing is the convenient and ready-to-use alternative to natural casings. There's no soaking, rinsing, or prep required and the casing is uniform in size. The casing's 38mm size is perfect for making large bratwurst, Italian sausage, and Polish sausage! This collagen sausage casing is odorless and flavorless. Its thick walls offer added strength to resist breaking, which is especially helpful when it's hung in smokers or dried in dehydrators. Despite the casing's thick walls, smoke is still able to permeate the meat and enhance the flavors of the sausage. Great for hunters, butcher shops, and meat departments, this casing is packaged in a convenient zipper seal vacuum bag for maximum freshness and easy storage. Whether you're grilling, smoking, or dehydrating meats, it will help save prep time! This casing makes 15 lb. of sausage. Weston 19-0301-W Natural Hog Casings - Makes 15-20 lb. Weston 19-0112-W 33mm Collagen Sausage Casing - Makes 15 lb. Weston 19-0101-W 19mm Collagen Sausage Casing - Makes 30 lb. Weston 19-0302-W Natural Hog Casings - Makes 25-30 lb. Weston 19-0111-W 19mm Collagen Sausage Casing - Makes 15 lb. Weston 19-0140-W 21mm Smoked Collagen Sausage Casing - Makes 15 lb. Weston 19-0212-W 2 1/2" x 20" Mahogany Sausage Casings - Makes 15 lb. Weston 19-0130-W 19mm Smoked Collagen Sausage Casing - Makes 15 lb. Weston 19-0102-W 33mm Collagen Sausage Casing - Makes 70 lb. Weston 19-0211-W 1 1/2" x 12" Mahogany Sausage Casings - Makes 10 lb. 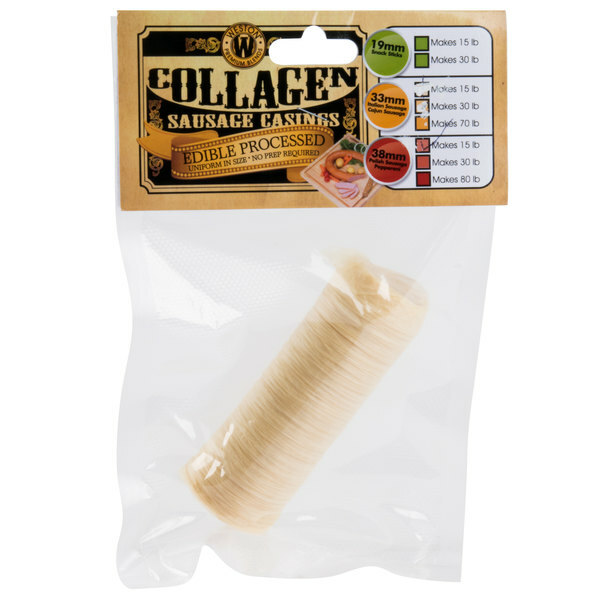 Overall User Rating: Weston 19-0113-W 38mm Collagen Sausage Casing - Makes 15 lb. These casings are perfect for making smoked sausage, easy to stuff. Just finished making a batch of andouille and they held up great on the smoker. This sausage casing is great because it's pork free! It works great and gives you plenty to make tons of sausage. Highly recommend this product!